I spent over half an hour yesterday speaking Hebrew with a native Israeli over Skype. It was an oral evaluation as part of the preparations for my two-week intensive ulpan which begins this coming Sunday! I had forgotten just how much I love that language until I got to listen to it again and speak it with surprising ease. I spent an hour after that just relaxing to Hebrew music and loving it all. It’s not only Hebrew, but the language aspect in general of my studies that I find myself most attracted to. This applies to whatever language pertains to wherever my current studies take me. 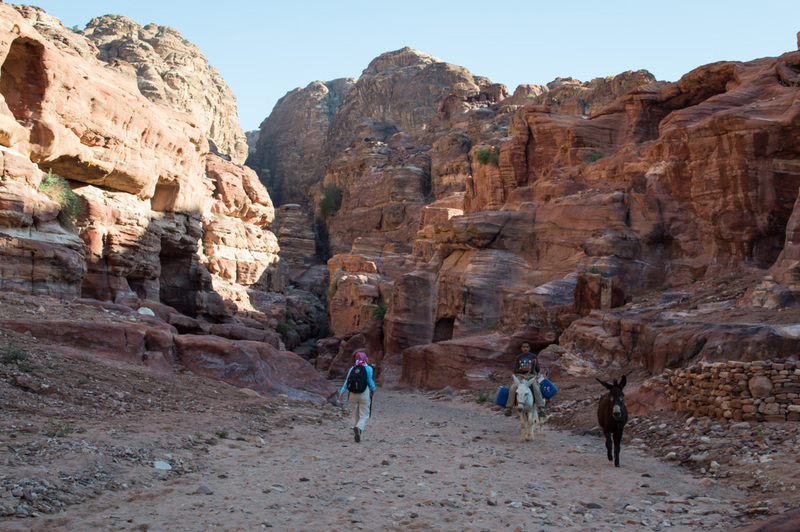 While I’m here in the heartland of the Nabataean kingdom, that language is Nabataean. 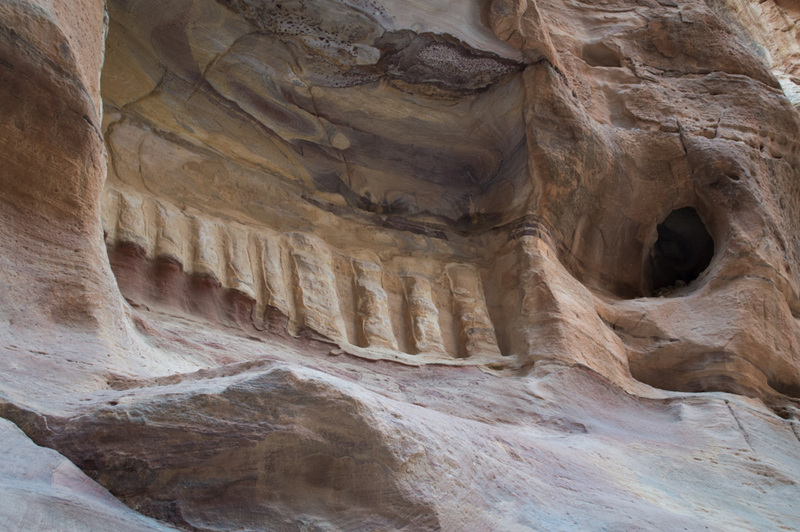 An interesting carving on the way to Al Khazneh. While I don’t wish to bore anyone with a full linguistic introduction, there are a few things I do want to explain. I’ll try to keep things simple and brief—something I often find hard to do. I can tell who my real friends are when they’ll happily sit through my non-sensical but excited ramblings out of duty instead of shared interest. For the few centuries spanning the rise of the Neo-Assyrian Empire until the fall of the Achaemenid Persian empire and the coming of the Greeks, the common language of the ancient Near East was Aramaic—a sister language to Hebrew and more distantly related to Arabic. This “Imperial Aramaic” spread throughout the whole region as the language of the elite and for inter-cultural communication. Eventually it trickled down to more common folk as a secondary language, though each area usually kept its own native tongue as well. This was somewhat similar to how English is used today throughout much of the world to communicate with foreigners, even when neither party comes from a natively English-speaking country. This is why certain late parts of the Old Testament are written in Aramaic instead of Hebrew. 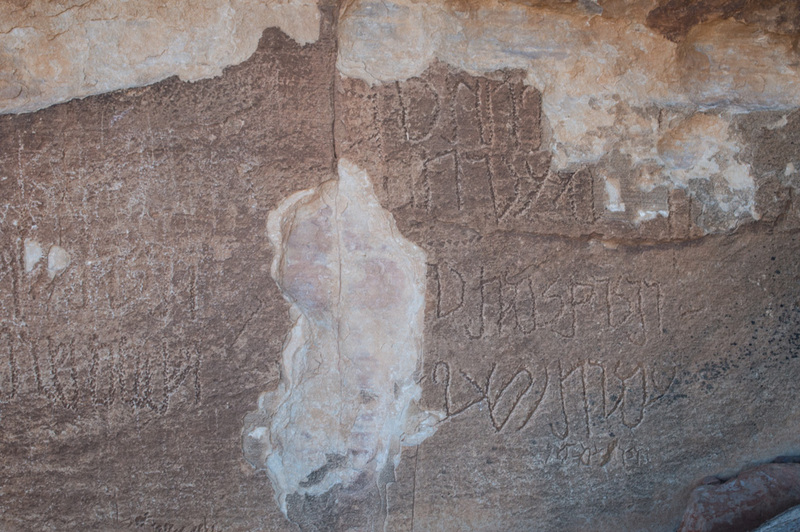 Nabataean graffiti can be found throughout the hidden passages of this rocky landscape. Anyway, the Nabataeans are believed to have been an Arabic-speaking tribe that migrated north from Arabia and settled in what today is Jordan and parts of southern Israel. 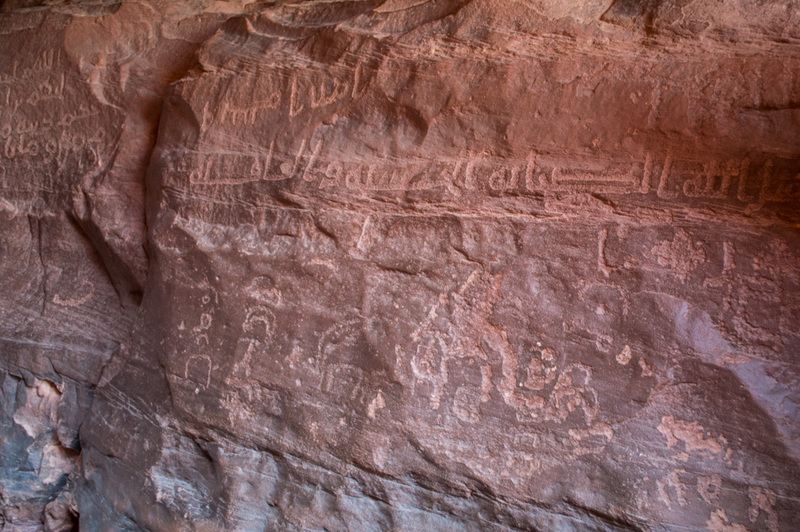 Though it’s believed that they natively spoke an old form of Arabic, almost all their inscriptions and records are written in a modified late Aramaic. By this point (second and first centuries B.C.E. ), some of the peoples in the Near East had modified Aramaic to their own needs and created dialects that combined it with their respective native languages. So in essence, the Nabataeans adopted Aramaic, modified the alphabet to be more cursive (much like the Syriacs did), and with time incorporated Arabic features into the language. 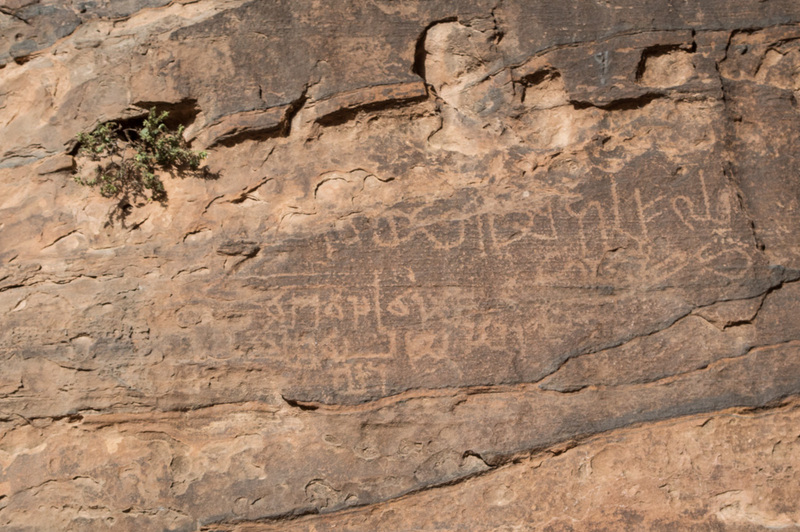 This resulted in a distinctly Nabataean script and language for official use, different from the Nabataean form of Arabic they would have spoken in daily use. Something else that’s cool is that their script continued to be used and modified long after the end of the Nabataean kingdom, and eventually resulted in the classical Arabic script still in use today. So, why does all this matter? Well first of all, it’s super cool. Secondly, because Aramaic is so closely related to Hebrew, I find it relatively easy to read. The script takes some getting used to, especially when n’s and b’s and l’s all look so similar, d’s and r’s are identical, and the writing in general looks rather messy, but with a little practice it’s gotten much easier and much more enjoyable. But really, the reason I’m writing so much about this is because my primary responsibility here has become to deal with inscriptions. 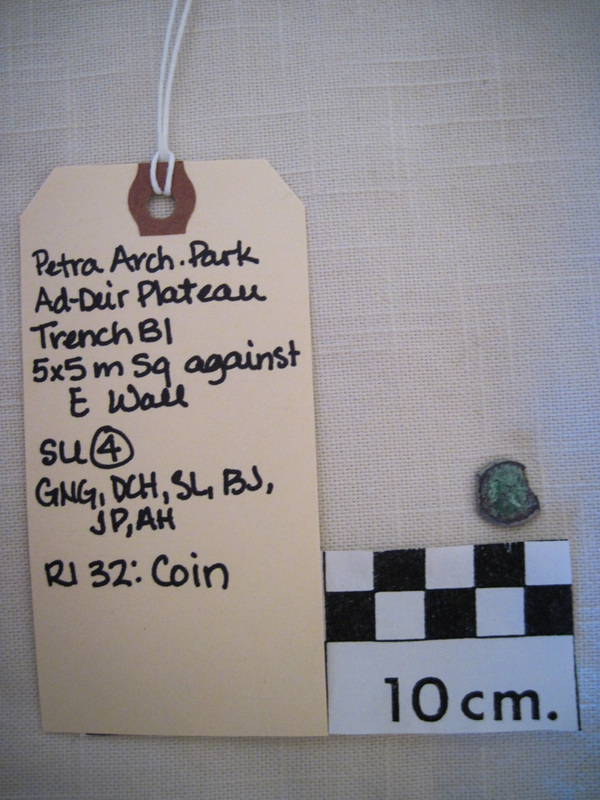 Not big inscriptions per say—since there are few and they have practically all been published already—but with the tiny inscriptions on the 60 or so coins we have found so far (and continue to find). One of the many coins I must analyze and ideally date. While Skyping with my dad recently, he was very surprised that there is still so much out there to discover in the dirt. Well let me assure you, there is. Plenty. I was assigned my responsibility with the coins precisely because of my interest in the Nabataean language. 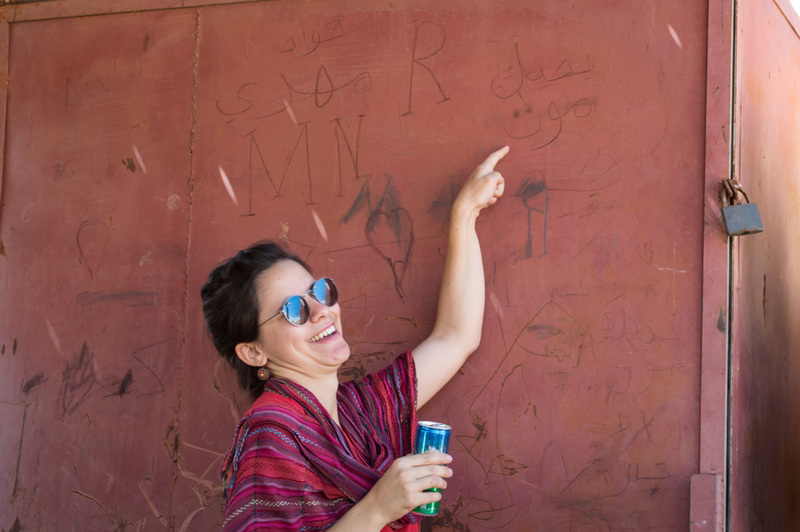 The director of our excavation at Ad-Deir saw this as a way to quench my thirst for inscriptions, and I’m very glad she did. I’ve now identified most of the coins and have learned much more about numismatics (just a fancy word that refers to the study of coins), Nabataean kingship, and ancient metallurgy than I could have learned otherwise. Laughing at Arabic graffiti that almost looks like Juan :) go. As I have repeatedly mentioned in some of my previous posts, one of the aspects of archaeology and history I love most is the fact that we get to know a people distant by both space and time, but who lived, experienced joys and sorrows, and died, just like the rest of us. That’s also why I find language so fascinating. Language in itself is just a tool and means nothing—it has no intrinsic value. It’s only when language is used to communicate meaning, to record events, to share knowledge, ideas, experiences, feelings, beliefs, transactions, names, etc.—that it becomes something, not only useful, but beautiful. A language is always intimately intertwined and fused with the culture that uses it. Tolkien, a linguist, knew that very well, so he created an enormous world with believable cultures and detailed histories and vastly different people in order to make his languages have meaning. And it worked, unlike the countless languages that have been invented but without a people and history to make them real. Old Arabic alongside much more ancient designs. So as with much else, that’s what studying the Nabataean language and script does for me: it helps me see the world through the eyes of a people long gone. Sure, coins don’t exactly have the most exciting inscriptions on them; believe me, I’ve stared at them enough to know that. But at the very least I get to see the names of their kings and queens in the language and script they would have heard and seen. 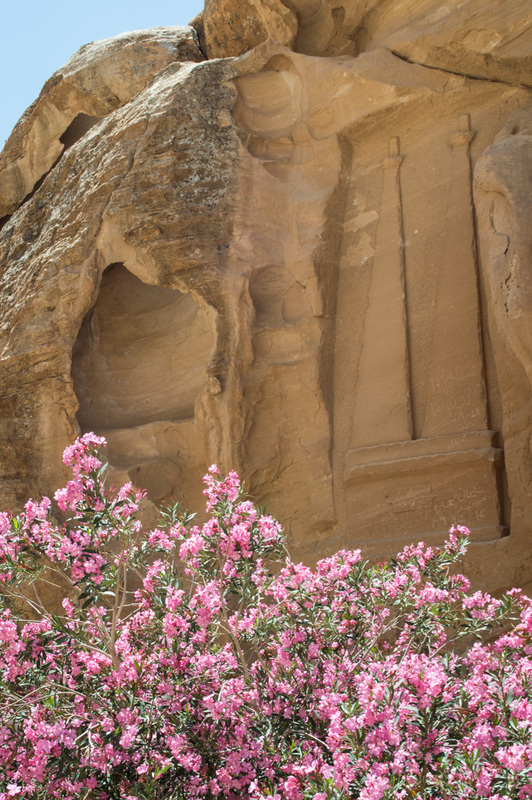 “Aretas the king, king of the Nabataeans, lover of his people”—in a way I can’t quite explain—carries much more meaning in the tongue of his people than it ever will in English.